Read this math major’s story to find out how a study-abroad opportunity ended up being a life-changing experience. Melissa Fulton, a senior mathematics major at Truman State University, always knew she wanted to have unique experiences, especially when it came to studying abroad. 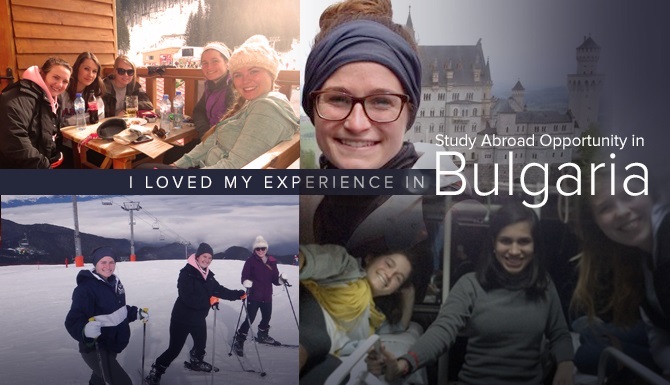 This desire to take the road less traveled led her to choose Blagoevrad, Bulgaria, for semester-long study abroad. “I wanted to go somewhere different, somewhere I would not have necessarily traveled to if I had not had the opportunity to study abroad,” Melissa said. During her time in Blagoevrad, she studied at the American University of Bulgaria (AUBG), a small university attended by students from all across Eastern Europe. This allowed her to meet students from Bulgaria, Russia, Albania, Greece, Georgia and Kazakhstan. Even though the AUBG and her home university were thousands of miles apart, Melissa was reminded of Truman through her host campus’ close community. Studying at AUBG not only allowed her to meet students from Eastern Europe but also other study-abroad students. Melissa enjoyed learning and expanding her understanding of other cultures. One of her favorite memories while abroad was relaxing with her friends after a long day of skiing in the mountains of Bankso, Bulgaria. After eating a traditional Bulgaria meal, she and her friends shared music and dances from their home countries. Beyond learning about other cultures, she was able to learn about herself. While abroad, she had the opportunity to take an environmental science course. This impacted her future career plans by igniting a desire to work overseas in the environmental science or public health fields. Overall Melissa sincerely recommends taking the time to study abroad. “Studying abroad allows you to learn about yourself and opens your eyes to the rest of the world,” Melissa said. She had the opportunity to see how world events impacted real people, such as discussing the relationship between Bulgaria and Syria with Bulgarian natives and listening to the concerns of Ukrainians about the recent events in Kiev. Above all, she credits her study abroad with teaching her to truly value friendships. She will always remember a night during her final week in Blagoevrad, where she and her friends climbed to the top of hill overlooking the city. Together, they reflected over their experience that semester and toasted a friend’s birthday at midnight. It was there that she realized no matter how amazing one city can be it is far better shared with a friend.